So, your directory has been built, and you are almost ready to publish it. You may be asking yourself how you get it into the hands of your congregation? We have some tried and true tips that will make rolling out your directory to your members a breeze. Do a final check of the directory. Are you missing photos of some of your families or individuals? Reach out to them by email, asking them to submit a photo. You may still need to come up with an alternate image if you don’t receive a photo after you’ve requested it. Check for photos appearing in the directory that may have an offensive background (things like trash cans in the background) and ask members to re-take and resubmit their photos. If your printed directory or online directory program comes with a mobile app, consider assembling a “directory app team” to assist members with downloading the app and creating a login for the first time. Give the team early access to the directory so that they can practice downloading the app, creating a username and password and logging in. On your team, attempt to have at least one person who has an iPhone or iOS device and at least one person who has an Android™ device so that you can cover the installment and log in experiences for both operating systems. Also, consider recruiting members of your youth group to be a part of the “directory app team.” Most youth have grown up with technology and can be a “buddy” for someone who may not be as technically savvy. An added benefit of having a multi-generational team is that it will help to foster inter-generational friendships within your church community. Next, prepare to announce the new directory via your Sunday morning bulletin or church’s newsletter. Incorporate a “guess what is coming?” feature a few weeks before you actually “launch” the directory to build excitement. Create flyers that announce that the directory is coming and distribute them at various events, explaining what members can expect to see within the upcoming weeks. Begin working with your church’s newsletter editor and administrator to get information into your church’s publications, bulletins and announcements. If you are using an online directory program, a great thing to have in hand are instructional tools that will guide members on how to access the directory, download available mobile apps, login to the directory and information on who to contact if there are questions. Emailing your members these tools is a great way to get the word out that the new directory is most here. Now for the fun part — rolling out the directory to your congregation and watching the excitement. A word of caution: If you are “launching” the directory on a Sunday morning, announce it at the end of the service. This will help to alleviate distractions during the service, as some members may immediately begin to access the directory via their mobile device. 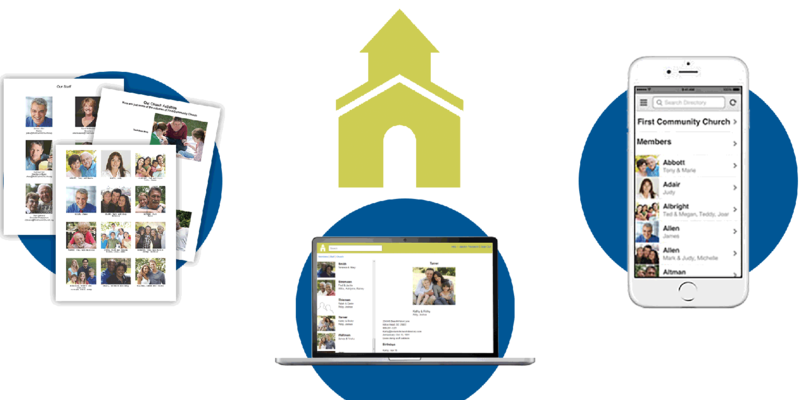 If you’ve secured volunteers to be on your “directory app team,” place them at various points throughout the church to assist members who may need help with downloading the directory mobile app and creating a login. Since members may not attend every Sunday, ask your church leadership to continue announcing the new directory for a few consecutive Sundays to be certain everyone has heard the news. You may also want to send follow up emails or announcements in your church communications to be sure every member is aware the new church directory is available and how they can access it. Now, you can sit back, relax and enjoy the directory you’ve worked so hard on. Melanie Koenig is a Customer Advocate at Communication Resources, Inc. She is actively involved in her church Sunday school and youth activities – and is always looking for new and fun ways to enhance the Church Ministry and create inter-generational connections. Melanie can often be found at the Softball Field cheering on her daughter with her husband and family.